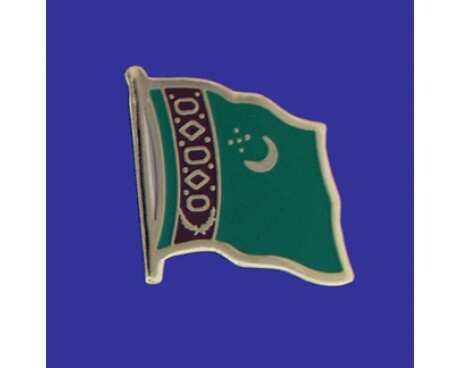 The flag of Turkmenistan (Turkmen: Türkmenistanyň baýdagy) was adopted on January 24, 2001. 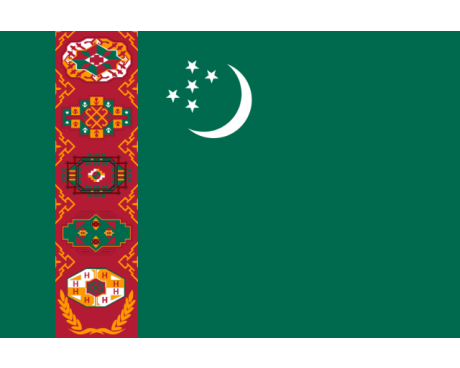 It features a green field with a vertical red stripe near the hoist side, containing five carpet guls (designs used in producing rugs) stacked above two crossed olive branches similar to those on the flag of the United Nations; a white waxing crescent moon, typical of Turkic symbology, and five white five-pointed stars appear in the upper corner of the field just to the fly side of the red stripe. 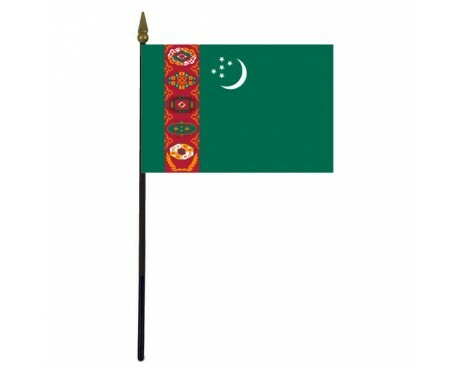 The green and red colors appear in this flag because they have been venerated historically by the Turkmen. The waxing crescent moon symbolizes the hope of the country for a shining future and the stars represent the five provinces (welayatlar) of Turkmenistan – Ahal, Balkan, Dashhowuz, Lebap, and Mary. The five traditional carpet designs along the hoist represent the five major tribes or houses, and form motifs in the country's state emblem and flag. These Turkmen tribes in traditional order (as well as top to bottom) are Teke (Tekke), Yomut (Yomud), Arsary (Ersary), Chowdur (Choudur), and Saryk (Saryq). The Salyr (Salor), a tribe that declined as a result of military defeat before the modern period, are not represented, nor are several smaller tribes or subtribes. The wreath is one of the odder parts of the flag, added against the rules of heraldry and breaking up the carpet pattern. It was added as an afterthought to represent the "status of permanent neutrality," which was accepted by the United Nations General Assembly on December 12, 1995.